We at RAISE UR PAW are requesting all assistance & aid to help catch person/persons involved in the brutal abuse/cruelty of a lab puppy in North York - Toronto, Ontario Canada. 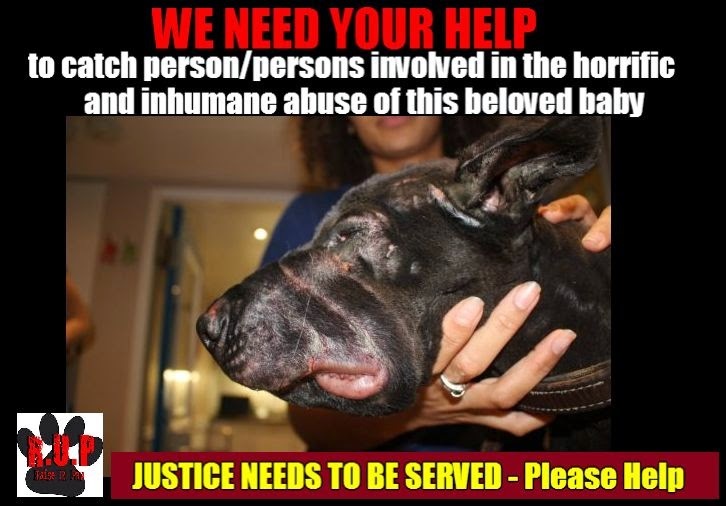 According to the article we read about the case, this innocent life was found with broken ribs, severe chemical burns and elastic around the muzzle, a truly heartbreaking sight that should not go unpunished. Unfortunately due to the extremities of the injuries the little life had to be put down - and the monster is still out there and who knows if they will strike again, so the hunt is on and help is urgently needed so that no other life will become victims of this person/persons. Found on a residential property in North York last Friday, with elastic band tightly around his muzzle which cause extreme swelling and injuries, and prevented the baby from opening his mouth. The poor life was not aggressive to those that were helping him and continuously rubbing his little face which was infected on his side, whimpering - and could not survive the extreme injuries that was inflicted upon him - so he had to be put down. WE ARE PLEADING WITH EVERYONE TO PLEASE HELP FIND THOSE INVOLVED AND BRING THEM TO JUSTICE - ANY INFORMATION WILL BE HELPFUL - ANYONE WITH ANY INFORMATION IS ASKED TO CALL 1-800-222-8477 - RAISE UR PAW AND LETS CATCH THIS PERSON/PERSONS AND BRING THEM TO JUSTICE, BEFORE MORE LIVES BECOME VICTIMS.